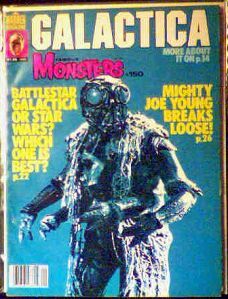 January 1979 issue of FM with features on Battlestar Galactica and the original Mighty Joe Young. One of the staples under the front cover is barely visible, but issue is near-mint otherwise. Check out the article on Mighty joe Young. I loved this movie as a kid and still think that it is one of the greatest technical achievements of pre-computer-generated special effects. Much of the work was done by Ray Harryhausen, who was an assistant to Willis O'Brien, of King Kong fame. Website design and hosting by Sohodojo Business Services. Item 127 of 466 items displayed in viewer. 0 items in cart.